These summery One Strap Baby Sandals were inspired by a friend of mine from Murcia, in the South East of Spain. I thought that living in such a warm place her baby would need some light sandals. 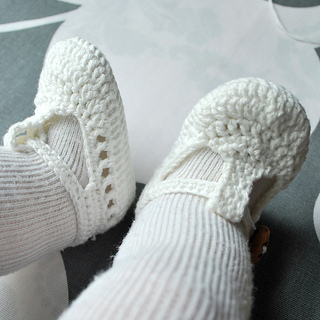 The yarns used for this pattern are Eco Cotton and Capri (pure cotton) by Katia. 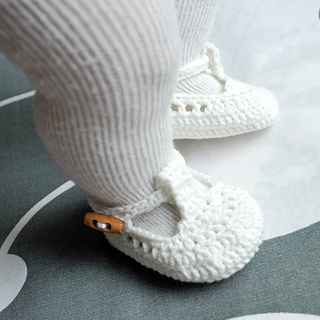 The cotton and the wooden buttons are a perfect match for the soft skin of a baby. These sandals are worked in the round, from toes to the heel, bottom to top in the round; this way the joints will end up hidden at the back. 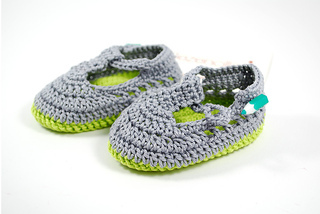 Both shoes are crocheted following the same pattern up to the straps; then follow the given directions to make left and right. 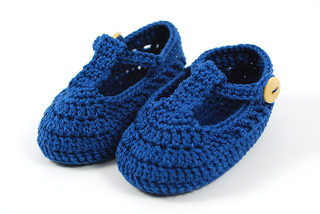 In this pattern you will find the instructions to crochet 4 sizes up to 12 months old.